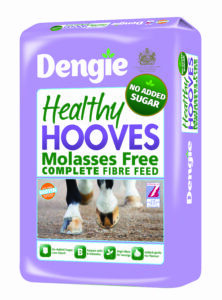 Dengie Healthy Hooves Molasses Free is the ideal low-calorie fibre feed to promote healthy hoof growth in horses and ponies. Lowest combined starch and sugar of any complete fibre feed – with just 2.5% sugar and 1.5% starch Healthy Hooves Molasses Free is naturally low in sugar and starch and is free from molasses. 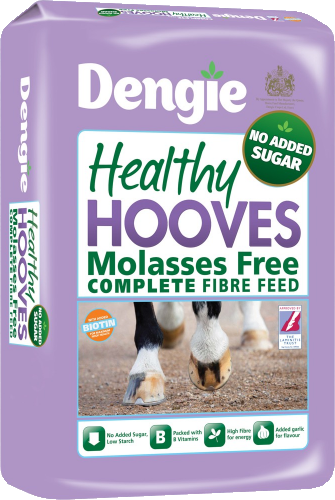 Low in calories but high in fibre, Dengie Healthy Hooves Molasses Free is perfect for leisure horses and ponies or those who maintain their weight well. Healthy Hooves Molasses Free is designed to be fed as the sole bucket feed alongside your horse’s normal hay/haylage ration. It is important the it is fed at the recommended quantities in order to provide the levels of nutrients your horse or pony requires; feeding less may affect condition or performance. If using less than recommended quantities, a broad spectrum vitamin and mineral supplement should be used alongside. If your horse is in hard work or needs help to maintain condition, try Dengie Healthy Tummy. A nutritionally balanced fibre feed combining chopped and pelleted alfalfa with a rapeseed oil coating and herbal blend. It contains the same amount of biotin as Healthy Hooves Molasses Free with the addition of protexin in-feed formula. Healthy Tummy is the ULTIMATE fibre feed to promote gut health in horses and ponies. A complete, high-calorie fibre feed that fuels work and promotes condition and also contains the latest ingredients known to promote gut health. Here are 5 key benefits you might not have known about Dengie Healthy Tummy.